This tutorial includes binding site analysis and comparison of related structures by superposition and morphing. Internet connectivity is required to fetch the structures 3w7f and 2zco. A cholesterol biosynthesis inhibitor blocks Staphylococcus aureus virulence. Liu CI, Liu GY, Song Y, Yin F, Hensler ME, Jeng WY, Nizet V, Wang AH, Oldfield E. Science. 2008 Mar 7;319(5868):1391-4. We will view and compare different structures of this enzyme. A splash screen will appear, to be replaced in a few seconds by the main Chimera graphics window or Rapid Access interface (it does not matter which, the following instructions will work with either). If you like, resize the Chimera window by dragging its lower right corner. If you want these icons to appear in later uses of Chimera, click Save before closing the preferences. Move and scale structures using the mouse and Side View as desired throughout the tutorial. 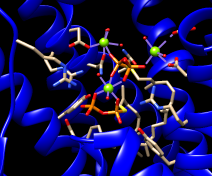 In this structure, the farnesyl thiopyrophosphate molecules are named FPS. Three magnesium ions help to offset the negative charges on the phosphates. The ions are shown as greenish spheres; clicking into the Chimera window and hovering the mouse cursor over each shows information in a pop-up balloon. Metal coordination bonds from FPS, water, and the protein are shown with dashed purple lines. Lines drawn to indicate interactions other than covalent bonds are called pseudobonds. Hovering the cursor over a pseudobond or bond shows balloon information about its end atoms and length. Water could be included in the various analyses, but is removed here to simplify the tutorial. Similarly, measure the distance between the sidechain oxygen of Tyr 248 and the same phosphate oxygen. Select the FPS residues (for example, with Select... Residue... FPS in the menu). Set Line width to 3. With the FPS residues still selected, click Designate. Now, 48 atoms should be designated for checking against all other atoms. Set the Clash/Contact Parameters to the default contact criteria (by clicking the button marked contact). In the Reply Log, the atom-atom contacts are listed in order of decreasing VDW overlap, the amount of intersection of atomic van der Waals spheres: 0 if just touching, positive if interpenetrating, negative if separated by space. Slightly separated spheres are still considered contacts by default. The distances between atomic centers are also given. Open the Selection Inspector by clicking the magnifying glass icon near the bottom right corner of the main window. It reports that 26 residues are selected. Click its Write List... button (or choose Actions... Write List from the main menu). In the resulting dialog, indicate that selected residues should be written. Click Log to write the list to the Reply Log instead of to a file. Ctrl-click to pick any atom or bond in Tyr 248. This will replace (clear) any pre-existing selection. Open the Selection Inspector again if it is not already open. Inspecting Residue (instead of Atom) shows that the sidechain angles chi1 and chi2 in this residue are approximately –107° and –142°, respectively. The backbone angles phi and psi are also given. Close the Selection Inspector. We will set up clash checking and rotate the sidechain interactively. Click into the main graphics window, then press the up arrow key on the keyboard to promote the atom or bond selection within Tyr 248 to the whole residue. In that dialog, click Designate. The 12 atoms of Tyr 248 should be designated for checking against all other atoms. Set the Clash/Contact Parameters to the default clash criteria (by clicking the button marked clash). Set the Treatment of Clash/Contact Atoms to Draw pseudobonds; turn off any other treatment options. Set the Frequency of Checking to after relative motions. The rotatable bond will be listed in the Adjust Torsions dialog. In that dialog, if the Near atom is set to N, the value reported is the chi1 angle. There are several ways to rotate a bond, including dragging the pointer on the dial, clicking the black arrowheads, and editing the angle value directly. If the dialog becomes obscured by other windows, it can be raised again from the menu (Tools... Structure Editing... Adjust Torsions). Use whichever method you prefer to rotate the bond. As the sidechain moves, yellow pseudobonds show any clashes, and the distance monitor updates automatically. The sidechain is fairly constrained; only chi1 angles of approximately –(100–120)° avoid clashes if only that bond is rotated. The sidechain can be frozen in a new position, but for tutorial purposes, simply restore it to its original position: in the Adjust Torsions dialog, click the entry under Bond to show a menu. In that menu, choose Revert (move back to original position) and then Deactivate (make the bond no longer rotatable). Close the torsion dialog. Click the Find Clashes/Contacts icon to bring the dialog to the front and Close it to halt clash checking. 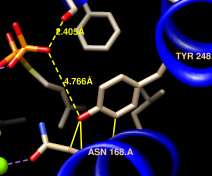 Next, we will compare the conformation of Tyr 248 in the structure to tyrosine rotamers from a library. This will indicate whether the sidechain is in a frequently observed conformation and whether other conformations might also fit into the structure. With part of Tyr 248 still selected (if not, Ctrl-click to to select any of its atoms or bonds), start Rotamers by clicking its icon . Click OK to show TYR rotamers from the Dunbrack 2010 backbone-dependent library. The rotamers are shown in the wire representation and listed in another dialog. The rotamer dialog reports chi1 and chi2 angles and probabilities from the library based on the residue's backbone conformation. Choosing a row (or rows) in the rotamer dialog displays just the corresponding rotamer(s). 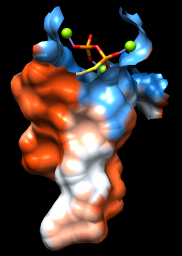 From the chi angles in the dialog and the 3D display, it is evident that none of the rotamers match the conformation in the structure. Other than the backbone angles, the probabilities given in the dialog do not take into account any interactions specific to this structure. However, the rotamer dialog is integrated with clash and H-bond detection. Choose Columns... Add... Clashes and click OK to use the default settings; repeat with Columns... Add... H-Bonds. The new columns show that each rotamer forms several clashes but no hydrogen bonds. We showed above that Tyr 248 H-bonds with the ligand and avoids clashes, which may compensate for its nonrotameric (presumably strained) conformation. A sidechain can be replaced with a chosen rotamer. With a single rotamer shown, either click OK in the rotamer dialog to replace the sidechain with that rotamer and remove the others, or simply Close the dialog to remove the rotamers without replacing the sidechain. 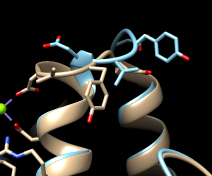 Although not done in this case, rotamers can be shown for a different amino acid type than in the structure, allowing for virtual mutations. Unlike Tyr 248, Tyr 41 closely resembles the highest-probability tyrosine rotamer given its backbone angles. If you like, focus on Tyr 41, select one of its atoms or bonds, and use Rotamers to show and evaluate rotamers of tyrosine or some other amino acid at that position. FPS and the natural substrate both have a highly polar/charged “head” and a long hydrocarbon “tail.” The enzyme pocket is very large and deep, as needed to accommodate two of these molecules. A surface representation is best for showing the shape of the pocket. Choose Presets... Interactive 3 (hydrophobicity surface) from the menu to display a molecular surface color-coded by amino acid hydrophobicity. This preset colors the surface ranging from dodger blue for the most polar residues to orange red for the most hydrophobic, with white in between. As one might expect, the mouth of the pocket near the phosphates and ions is mostly polar, while the rest of the pocket is largely hydrophobic. However, the pocket is so deep that it is hard to see when the whole surface is shown. Restricting the surface display to the pocket region allows it to be viewed from the outside, as shown in the figure. The sop (“surface operations”) command limits the display of surface #0 to a 5.0-Å zone around the ligand and shows only the largest resulting fragment. Without max 1, a few additional disconnected shards of surface would be shown. If you like, try different cutoff values; the figure shows results for a cutoff of 4.7 Å.
Amino acid hydrophobicity is one example of an attribute. Another attribute commonly used in structure analysis is atomic B-factor. B-factor values indicate which parts of the structure are more or less flexible or disordered. The Render by Attribute tool shows attribute values with colors and other visual cues. Choose Tools... Depiction... Render by Attribute from the menu to start this tool. The dialog is set to atoms when it appears. Choose bfactor from the attribute menu. 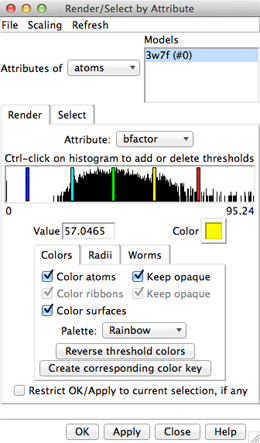 The B-factor values are shown in a histogram, and the vertical bars on the histogram define a color mapping. These bars or thresholds can be dragged along the histogram with the mouse, and their colors can be changed. Clicking the square color well allows changing the Color of the threshold that was most recently clicked or moved. The colors can also be changed collectively by choosing a different Palette or clicking the button to Reverse threshold colors. (The figure shows the dialog after a user has added more thresholds, chosen the Rainbow palette, and then reversed the colors.) Adjust the color mapping as desired and Apply it to the structure. The lowest B-factors are in the protein core, the highest in a loop over the active site and the C-terminus on the opposite side. If any sidechain has been replaced with a rotamer, the new atoms will not have B-factor values, but they can be assigned a No-value color. In the Render dialog, switch from atoms to residues and show the histogram for the attribute kdHydrophobicity, the Kyte-Doolittle hydrophobicity of amino acids. This is the same attribute as used by the surface preset, but different coloring schemes can be applied. Larger positive values correspond to more hydrophobic residues, negative values to hydrophilic residues. The No-value color pertains to residues without Kyte-Doolittle hydrophobicities, namely any that are not amino acids (such as the ligands in this structure). The colors can be changed as described above. Apply coloring by hydrophobicity if you like, then Close the dialog. Now the first structure is tan and the new structure is sky blue, as shown in the Model Panel (Tools... General Controls... Model Panel). MatchMaker first generates a sequence alignment using residue types and secondary structure (tries to align helix with helix and strand with strand), then fits the sequence-aligned residues in 3D by pairing their CA atoms. The show true option displays the sequence alignment. By default, the fit is iterated so that far-apart pairs are not included in the final match. This allows the most similar parts to superimpose more tightly and the dissimilar parts to stand out. Final match statistics are reported in the Reply Log, and the pairs used in the final fit are shown with light orange boxes on the sequence alignment. The RMSD histogram above the sequences shows spatial variability, calculated as the root-mean-square deviation among the CA atoms of residues associated with each column. In this case (only two structures), the RMSD value is the same as the CA-CA distance. Morphing involves calculating a series of intermediate, interpolated structures between the original input structures. In Chimera, the series of structures is treated as a trajectory that can be replayed, saved to a coordinate file, or saved as a movie using MD Movie. Click Add... and in the resulting list of models, doubleclick to choose #0, #1, and #0 again, corresponding to a morph trajectory from the ligand-bound structure to the empty structure and back. Close the model list. In the main Morph Conformations dialog, set the Action on Create to hide Conformations, and then click Create. The progress of the calculation is reported in the status line. When all the intermediate structures have been calculated, the input structures are hidden, the trajectory is opened as a third model (#2), and the MD Movie tool appears. The trajectory can be played continuously or one step at a time by clicking buttons on the tool, or a frame number can be entered directly. If the MD Movie playback dialog becomes obscured by other windows, it can be raised using its instance in the Tools menu (near the bottom of the menu, below the horizontal line). In this case, the secondary structure does not change much between the input structures. When conformational differences are larger and ribbons will be displayed, one may want to re-evaluate the secondary structure at each step of the trajectory. That can be done by putting the command ksdssp in a per-frame Chimera script in MD Movie. Such scripts also allow performing actions (such as showing/hiding a ligand) at specific steps in the trajectory. The Morph Conformations page lists a few additional example systems. When finished enjoying the morph trajectory, choose File... Quit from the menu to exit from Chimera.